The Enterprise version of JLMS is our flagship product. JLMS Enterprise has been developed over the course of many years with the functionality within being driven by our clients and their real needs for managing a learning strategy. JLMS Enterprise does everything you need for a straight forward, out of the box solution, at an affordable price, and it will look like your own. JLMS is fully scalable, and allows you complete customisation capability to reflect your identity and help learners feel at home. All the reporting you need is there too, along with many features to ensure your learners always get to the content they need quickly and easily. It Is Flexible: JLMS can be deployed as a single instance or multi-instance giving you the ability to segregate different areas of your business and give them the autonomy of having their own area of the LMS. Think "Extended Enterprise". JLMS can be branded however you like, and localised into different languages if you have learners in more than one country. You can also adapt the navigation to suit the needs of your users and administrators. It Is Scalable: JLMS is fully scalable and will be an effective LMS catering for as little as one user to an entire organisation containing thousands of learners around the world. As your learning community grows, JLMS will grow with it. It Is Fully Customisable: JLMS’s look is fully customisable to reflect your company’s brand and identity. The familiar ‘look and feel’ helps to make learners feel at home, makes them feel more at ease in the learning environment and encourages them to focus on the content without any unfamiliar branding to distract them. It Has a Clean Interface: Navigating around the LMS is clean and simple. The emphasis has been put on making the experience for the learner as straightforward as possible and providing direct access to the important things straight from the home page. It Is Compliant: JLMS is SCORM compliant and fully AICC HACP compliant. This means that courses from other SCORM and AICC compliant vendors can be deployed through JLMS. You can also deploy your own authored courses that have been exported to a compatible format. JLMS will very soon be Tin Can/xAPI compliant too. Leading enterprises are required to seek every advantage to stay on top, and to provide their employees with the best advancements available to achieve their goals. To enable this they need the ability to maintain and develop the skills necessary across the organisation, whilst catering for all the distinctive differences between roles and responsibilities. A Learning Management System must be flexible to cater for all these differences and also have the power to deliver the learning in a simple yet comprehensive manner. JLMS Enterprise is our flagship product and has been developed over the course of many years with the functionality within being driven by our clients and their real needs for managing a learning strategy. In today's diverse world every enterprise is different, with their own unique culture and competitive advantages. Your learning solution must adapt to how your enterprise works, not force you to adapt to it. JLMS has been built from the very beginning with a policy of flexibility, of adapting the system to suit each individual enterprise. The Adaptive Learning Architecture allows you to tailor the system to your individual needs, to suit your processes, to suit your enterprises unique advantages. JLMS's popularity with international corporations has been due to it's unique architecture that allows rapid and easy modification to work with the differences in today's modern enterprises. 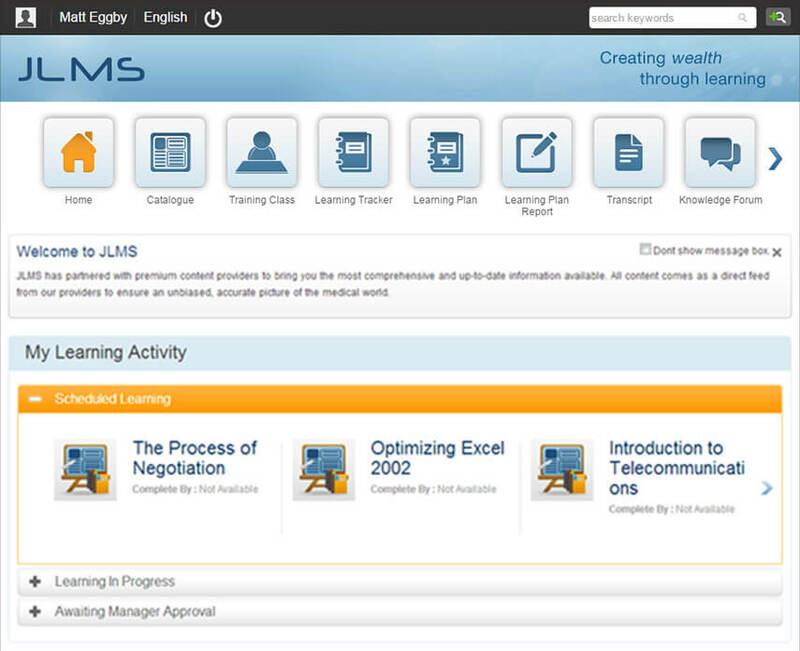 JLMS incorporates experience with hundreds of thousands of users in different cultures and with different learning processes and priorities. This has resulted in a system architecture with the flexibility and power to adapt to your needs, to adapt to your processes. This real customization ability becomes an asset for your enterprise, allowing rapid return on investment. JLMS is enterprise aware. It contains advanced technologies for scalability and reliability. For the Technical Manager, it is designed to work on server farms and with distributed content servers. For the Team Managers, it is designed to provide them with the tools to ensure staff are meeting their minimum learning requirements. For the Legal and Internal Audit Departments, it contains the reports that confirm compliance with statutory course requirements. For the HR Department, it has the ability to handle varying users with different needs. For the Learning Director, it contains the ability to gain accurate intelligence on the whole organization's learning habits. From top to bottom, JLMS is designed to work with your enterprise, the way you work.